Like many people, I love to eat but I'm always looking for ways to eat well but stay on a healthy diet. 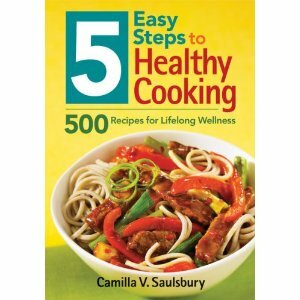 Camilla V. Saulsbury's book "Five Steps to Healthy Cooking" fits the bill. The author's public relations representatives sent me an evaluation of this cookbook and I've been riffling through the pages enjoying the pictures, tips, nutritional informational and even storage tips provided by the Author. As a busy working woman, I don't always cook as much as I would like to at home. But when I put the effort into cooking, I want it to be good and easy. With the exception of a few vegetarian recipes for making veggie or chickpea burgers, the majority of these recipes don't take long to throw together. Everything is laid out in easy steps and helpful tips. Information on the food ingredients is provided via call out boxes and sidebars throughout the book. When you're busy, it's easy to glance at the 500 recipes in this book and pick out a few that are appealing for the ingredients and the nutritional value, and then decide which ones you want to make. There are no "hidden calories" here as everything is disclosed in the nutritional information boxes including calories, fat, cholesterol, carbs, fiber and protein. There are a few salad recipes in this book that I highly recommend for summer. Both the "Fennel, Orange and Olive Salad" and the "Arugula, Watermelon and Feta Salad" are simply amazing and unique. You can bring these to any gathering and not run the risk of someone else turning up with the same dish. If you're a vegetarian cook, there are many wonderful dishes in this book that will be appealing to you. To literally get a taste of Camilla Saulsbury's recipes, check out her blog " Enlightened Cooking." If you love seafood, and you have some serious cooking time, check out her amazing Fire Roasted Seafood Stew with Fennel and Fresh Herbs recipe. 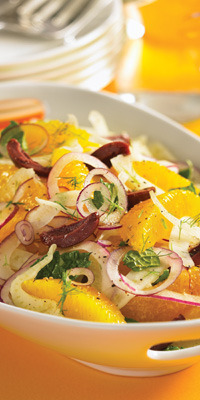 Here's a tempting excerpt from the book, the Fennel, Orange and Olive Salad recipe. Using a sharp knife, cut peel and pith from oranges. Working over a large bowl, cut between membranes to release segments. Squeeze the membranes to release any remaining juice into the bowl. To the oranges, add fennel, red onion, mint, salt, pepper and oil, gently tossing to combine. Sprinkle with olives. To prepare the fennel bulb, trim off the tough stalks from the top and the bottom root end before cutting the bulb in half. Chop any feathery fronds from the stalks and sprinkle on top of the salad with the olives, if desired. If the outer layers of the bulb are tough and stringy, you can discard them or peel off the outer layer with a sharp vegetable peeler. Excerpted from 5 Easy Steps to Healthy Cooking (page 116) by Camilla V. Saulsbury © 2012 Robert Rose Inc. Reprinted with permission. All rights reserved.